On the 10th anniversary of Orthphoto.net existence I would like to send my congratulations and words of recognition. The activities of Orthphoto founders and their co-workers, who are spread worldwide, successfully fulfills the objective that serves the Orthodox Church. Not only does your website show the beauty of Orthodoxy, but it also unites people of different views, religious and not religious ones. This is valuable in the contemporary world. During ten years your website became a landmark in the Orthodox landscape in our country as well as in other Orthodox and non-Orthodox countries. Apart from its core activities Orthphoto also got engaged in numerous different projects like organizing photo exhibitions, publishing albums etc. All of those projects bear witness to the spiritual and material richness of our church. I would like to congratulate you and at the same time thank everyone who is involved in Orthphoto project. Special thanks to You, Mr Wasyluk, for your effort in organizing and coordinating of the website. God bless you. I would like to thank everyone for their work. May God bless your future work for the good of the Holy Orthodox Church. 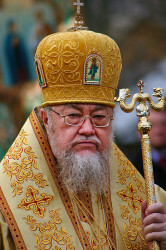 Sava, Metropolitan of Warsaw and whole Poland.